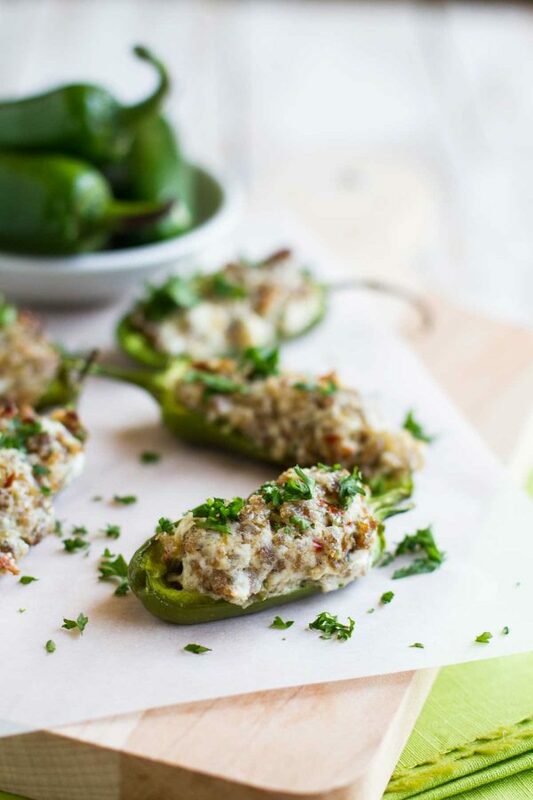 These Sausage Stuffed Jalapenos are the perfect appetizer – jalapeño halves that are filled with a sausage and cheese mixture for a cheesy and spicy appetizer bite. Perfect for game day or for company. If you know me, or if you have been reading here for awhile, you know that I’m not a huge sports person. I’m not against them, and I don’t hate watching them. I think I’m just missing that competitive bone in my body. I always feel sorry for the loser. So yeah, I have a hard time really getting into the competitive aspect of it all, which is a big part of sports. So it’s only natural that I start thinking about the best kinds of foods and appetizers for when others are watching the game, right? That’s the part I can always get into. And when I think of sports, and people sitting around cheering on their favorite team, I think of easy, hand-held food. Something that’s not fussy, but is crowd pleasing. When I first started thinking about it, jalapeno poppers came to mind. I love them. Can’t get enough. Baked or fried – it doesn’t matter. I also knew that I needed to change things up a bit. The first thing that popped into my mind were my favorite Sausage Stuffed Mushrooms. (Another favorite appetizer!!) And then it hit me – what if I combined the two? What if I filled the jalapenos with the sausage and cream cheese mixture instead of mushrooms? And luckily, it was a smashing success. Even my husband – who is a self-proclaimed jalapeno hater – ate his fair share of these. They are spicy and full of flavor, and the perfect appetizer for basketball watching, in my opinion. Or for any occasion you need an appetizer. Or serve them up for Friday night dinner – I know I’d be happy with them!! 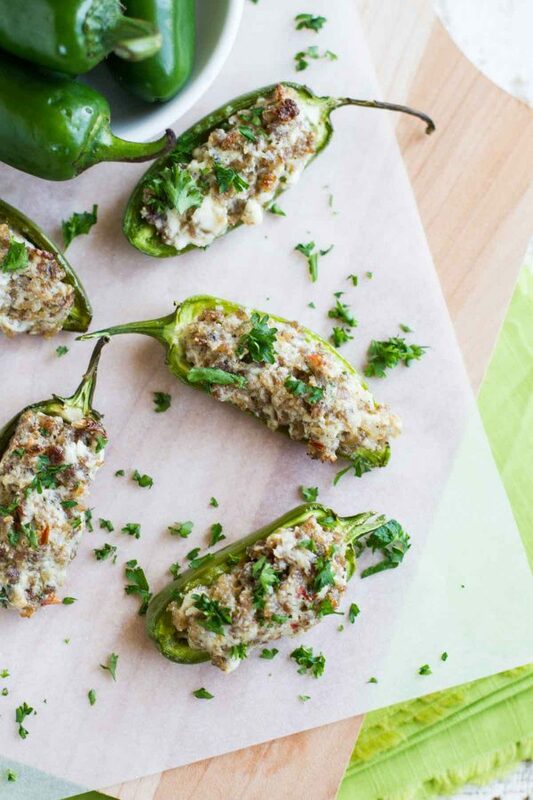 If you are a stuffed jalapeno lover, this is a must try! Cook the sausage in a skillet until it is browned and cooked through. Put the cream cheese and the Parmesan cheese in a bowl. Add the cooked sausage to the cheeses, then add in the sage and the parsley. Stir these all together. 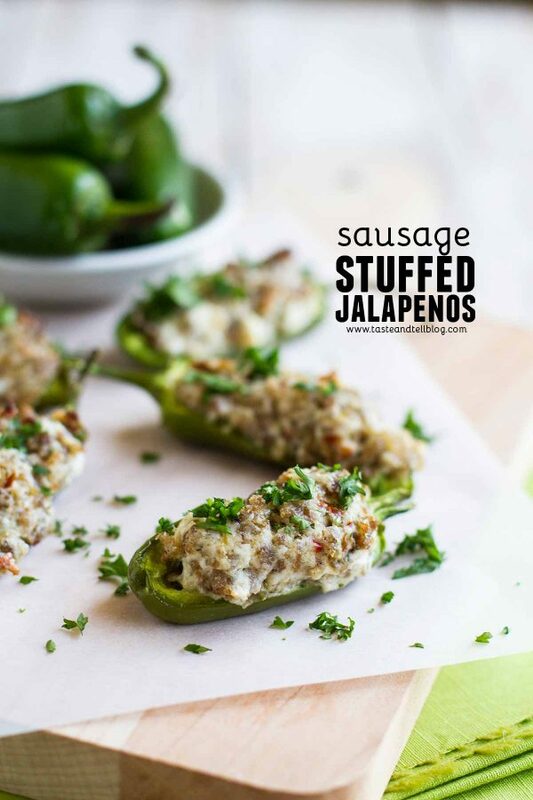 Take each of the jalapeno halves and fill them with the sausage filling. 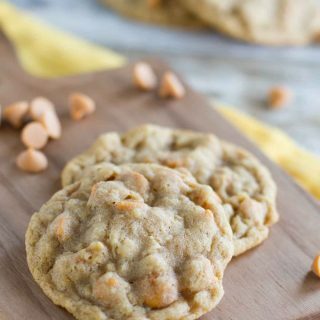 Place the filled halves on a baking sheet or in a baking dish. 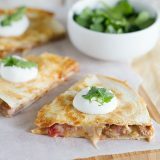 Bake them in a preheated oven until the jalapenos are slightly soft and the filling should be browned, about 30 minutes. 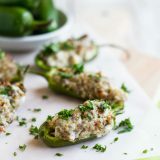 Can you make stuffed jalapenos ahead of time? While you won’t want to make them from start to finish ahead of time, you can do some prep to make them super easy when it’s game time. 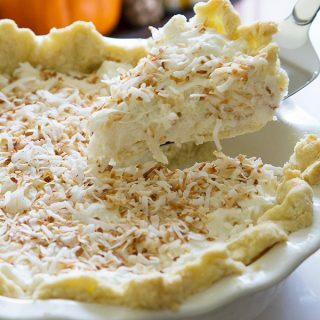 You can make the filling ahead of time and store it in an airtight container in the refrigerator. 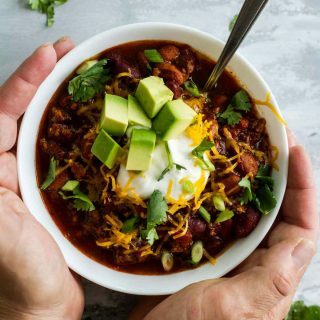 You will want to let it come to room temperature for about half an hour so it is soft enough to scoop to fill the jalapenos. Along with this, you could half and de-seed the jalapenos ahead of time, as well. You could fill the jalapenos, but not bake them until right before you are ready to serve them. 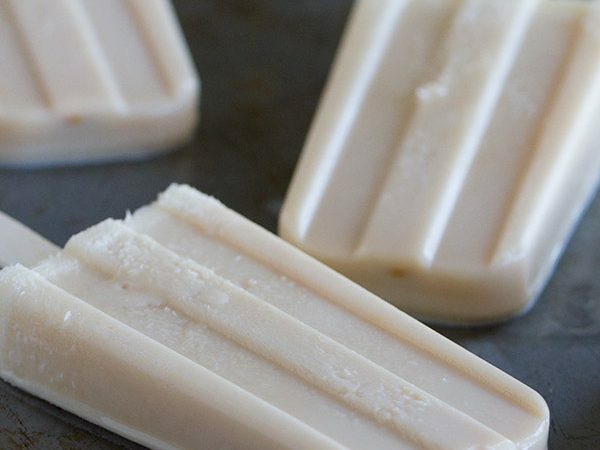 I wouldn’t do this too far in advance because it would be hard to keep them covered and refrigerated, but this would make it really easy to just pop them into the oven. You will need a skillet to cook the sausage – my favorite is a cast iron skillet. I like to use a paring knife to cut the jalapenos – especially for removing the seeds. These Sausage Stuffed Jalapeños are the perfect appetizer – jalapeño halves that are filled with a sausage and cheese mixture for a cheesy and spicy appetizer bite. Perfect for game day or for company. Place the sausage in a a medium skillet and cook until browned, breaking up as you cook it. Drain, if necessary. Place the cream cheese and parmesan in a medium bowl. Pour the sausage over the cheeses and mix to combine. Stir in the sage, red pepper and the parsley. Fill each jalapeño half with some of the sausage mixture. Place on a baking dish. 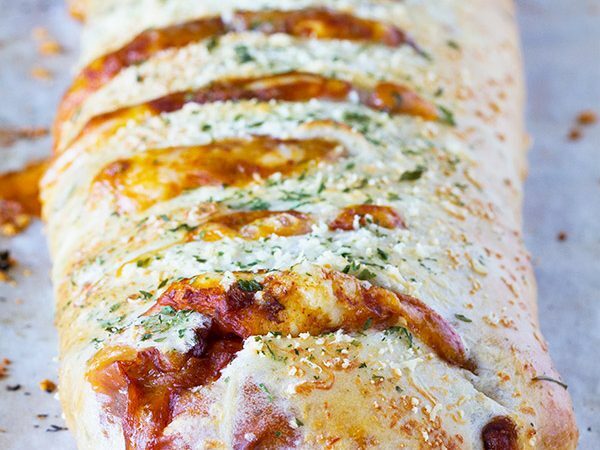 Bake until lightly browned, about 30 minutes. Those look sooo good! I love jalapenos! These really are just so darn perfect!! Ooooo, I bet this is good. I’m with you, not a sports fan, but the food, oh the food. Oh this sounds amazing! Not a huge fan of sausage but hey.. I still want this! So these look completely awesome but I am deathly afraid of any kind of spicy heat. Back story-I told my dad to shut up when I was like 5 or 6 years old and he told me if I ever said that to him again he would dump tabisco sauce down my throat. So I called his bluff and well- yeah, he poured that hot stuff down my throat. (Hello child protective services, lol) So that kind of was an intense moment-I certainly learned not to call my dad’s bluff again. But ever since then, I’m had an aversion to spicy food. I’m super afraid of it. Like an Anaheim pepper is as far as I go…well, I’ll gut the seeds out of serrano, but I can only eat just a little bit. So here you are posting these deliciously stuffed jalepeno’s when in real life I’m actually faced with another decision right now. 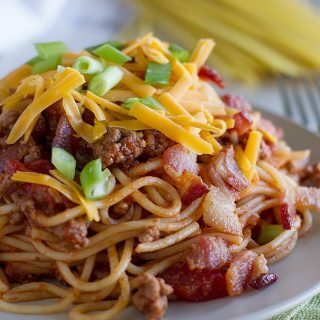 Josh and I are going out to dinner tonight and I was trying to decide what I wanted to order off the menu ahead of time when the fish and chips caught my eye up until the jalepeno tarter sauce 🙁 At some point, I need to get over my fear of spice so I can enjoy some of these kinds of recipes you post because I honestly feel like I am missing out! The men in my family love jalapeno poppers (like they want them for every.single gathering that involves finger foods and appetizers). 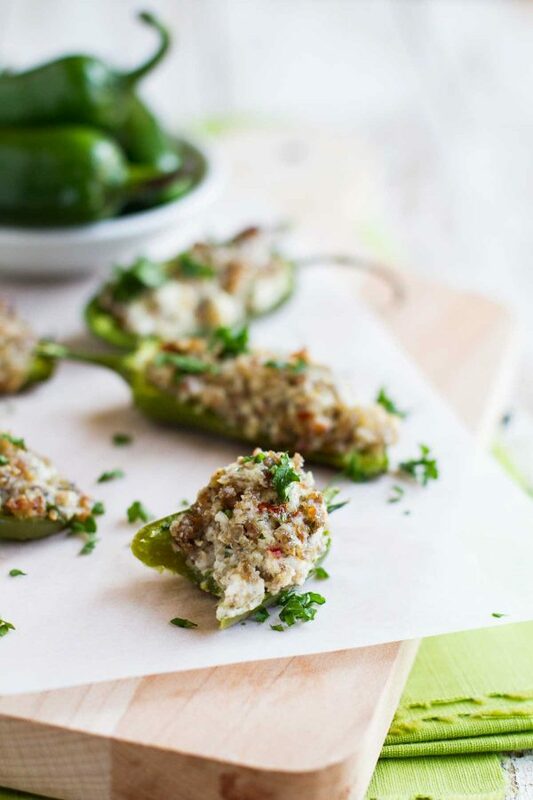 I love traditional jalapeno poppers but I totally think we could use something new! 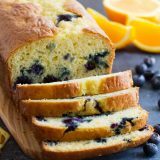 This recipe might just be the answer! The.Boy hates spicy food but loves stuffed jalapenos, so I really try to capitalize on any opportunity to make them! I know he would love these! Those would disappear so fast at my house. 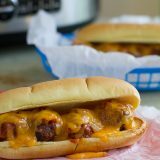 I love the combo of the sausage and jalapenos! My husband loves jalapeno peppers, so I just know he will go crazy for this fun filled version!!! They sound delicious! This is basically the best thing ever. My English husband hates American sports but loves jalapenos.I’m going to keep these on the list for the World Cup in June where I will, apparently, be watching three football matches a day. Eek!